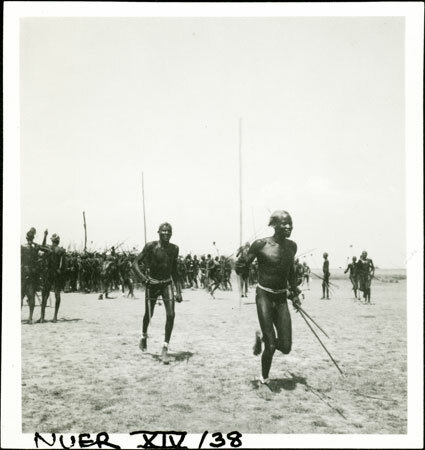 Two men with spears run toward the camera, with other groups beyond on the dance ground. This sort of war play was a common feature of such dance gatherings where initiated youths of differing villages faced each other in mock running battles as a show of group prowess. Dances were also significant occasions for courtship. The people are described as Jikul, a lineage or clan name not associated with one particular tribal territory, but which was a significant lineage around Nyueny and surrounding villages in Leek country where Evans-Pritchard conducted the bulk of his fieldwork in western Nuerland, but also a significant residential grouping among the Western Jikany, where this image was probably taken. Note on print reverse ms pencil - "8 Jikul" & print front border ms ink - "NUER XIV/38"
Morton, Chris. "Nuer men at dance" Southern Sudan Project (in development). 03 Jan. 2006. Pitt Rivers Museum. <http://southernsudan.prm.ox.ac.uk/details/1998.355.669.2/>.